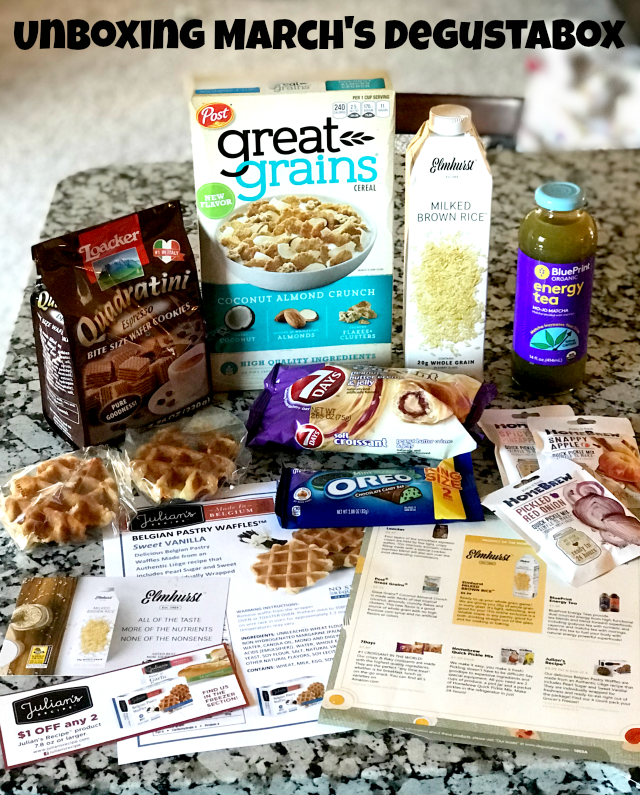 I have been reviewing the Degustabox for over a year now and although I have loved the majority of the products that I have discovered along the way, this month was a hit or miss box in my honest opinion. Maybe you will have a difference in opinion though. Loacker. Four layers of the smoothest espresso cream are held by five light, crispy wafers. This intensely aromatic cream filling made with a special Loacker espresso blend will also win over the most demanding connoisseurs. OREO. Delicious bits of OREO cookie mixed in smooth, mint flavored crème filling and coated in chocolate candy. Post Great Grains Coconut Almond Crunch is made with flecks of real tropical coconut, almonds, crunchy flakes, and clusters. This new flavor is a good source of whole grain with no high fructose corn syrup and no artificial flavors. Elmhurst MILKED BROWN RICE. Ready to up your whole grain game? Giving you 20g of whole grain in every glass. It's light, refreshing, and good for you! This online exclusive is a reliable staple in any pantry; good for both drinking straight out of the glass and for cooking or baking. BluePrint Energy Teas provide dual-sourced energy from high-functional tea blends and trend-forward superfoods, including guayusa tea with turmeric and cayenne and matcha tea with moringa. Drink this tea to fuel your body with natural energy powerful superfoods! 7Days. #1 Croissant in the world! This crispy and flaky croissant is made with the highest quality ingredients. They are the perfect "any time treat", whether it be breakfast, brunch or on-the-go snack. You can find all 5 varieties on Amazon.com. Homebrew Quick Pickle Mix. Pickling doesn't have to be difficult. Say goodbye to expensive ingredients and special equipment. All you need are 2 cups produce, a pint jar, and a packet of Homebrew Quick Pickle Mix. Make pickles in the refrigerator in just 24 hours! Julian's Recipe delicious Belgian Pastry Waffles are made from an Authentic Liege recipe that includes Pearl Sugar and Sweet Vanilla! They are individually wrapper for freshness and ready-to-eat right out of the package! Find their 4 count pack in your Grocer's freezer! The retail value of this box was around $26 and my readers can score a box of your own for only $9.99 (normal price is $19.99) plus free shipping AND a FREE gift too! Just click HERE and enter J0HJB in the promo code section. This looks like so much fun--I need to get a subscription box! 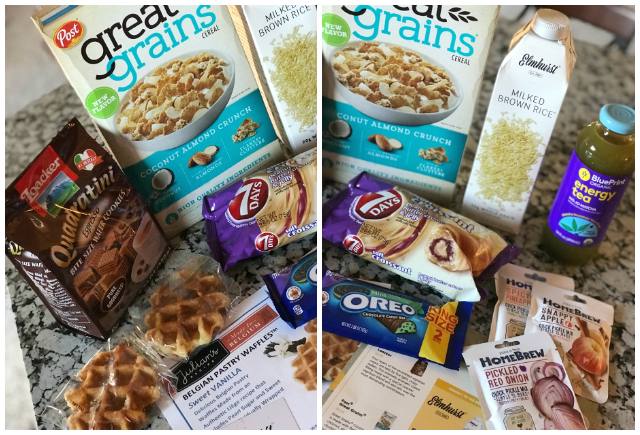 What a ton of great products to try! I'd love to try that OREO chocolate bar! What a great box! I know I would love the Loacker and the OREO. I feel the same way as you regarding March’s box! It can be a hit for some, but in my opinion, this box is a miss for my family! I think $9.99 is a fair price for this box, but not $19.99. I do like the ordering online options and that it’s delivered to your door every month. That’s really convenient, especially to someone disabled or without a vehicle! I shared this on my Facebook page. Thank you for sharing! This would be such a fun subscription box to sign up for! I love trying new things. :) Sometimes it is hard to find them though, so it would be great to have them delivered. Thanks for sharing!